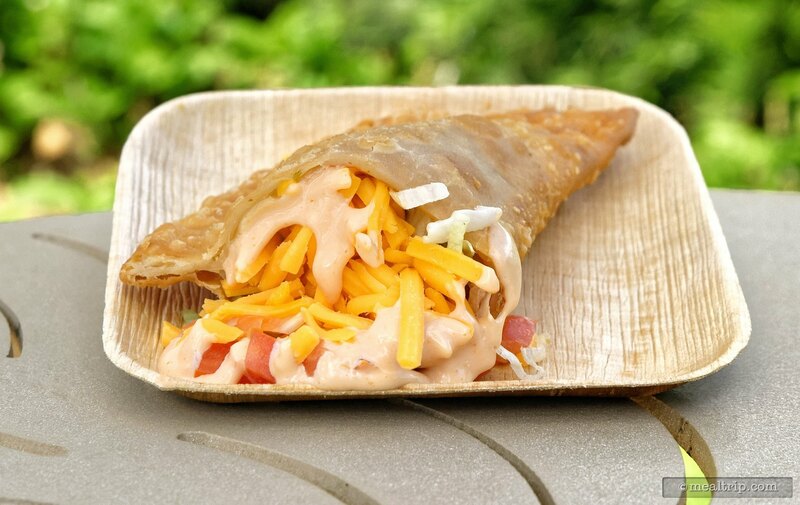 There's just two more days left for this year's Seven Seas Food Festival at SeaWorld Orlando, so it's time for "last bites". I had a chance to sample, almost all of the new items this year. Here's a rundown of a few items that I had on my second stroll-around day! The new "Empanadilla Loca" is sure to be a favorite with those guests that are little less food adventurous. The Pizza Empanada with Cheese, Beef, Mayo-Ketchup, Lettuce, and Tomato are a tried and true combination. The new "Empanadilla Loca" from the festival's Latin-Infused Cuisine area is a Pizza Empanada with Cheese, Beef, Mayo-Ketchup, Lettuce, and Tomato. The Pizza Empanada is now one of four Empanadas being offered in the Latin-Infused Cuisine area (cheese and tomato sauce, beef, and chicken are the other three), and all are part of the "sampling lanyard" program. 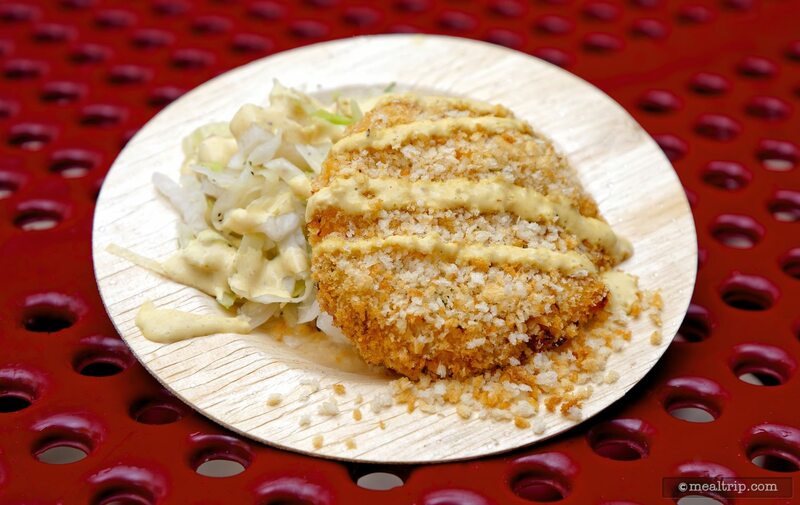 The Crab Cake with Jícama Slaw and Key Lime Mustard is highlighted as being new this year -- but I kind of feel like it was an item last year, just at a different festival marketplace. No matter, this item (now located at the Caribbean Market booth) was one of my favorite items on day two! The Crab Cake with Jícama Slaw and Key Lime Mustard is from the Caribbean Market booth. The Carb Cake itself is a pretty decent size, and the lightly packed half panko-esque coating was perfect. The cool and crispy Jicama Slaw is a perfect counterbalance to the warm Crab Cake and the Key Lime Mustard provides a little sweet and tanginess to the small plate. Next up, the Gulf Coast Market and their "Chicken and Sausage Gumbo". So, I don't hate okra - really… but there's a limit, you know? I think that limit has been reached when the Gumbo sauce is so thick with the sliminess from the okra, that it becomes the single most notable aspect of the dish. 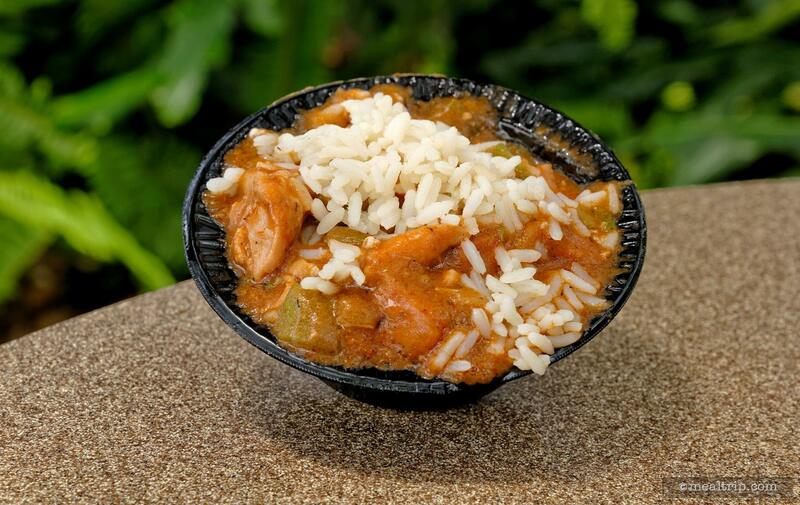 Chicken and Sausage Gumbo from the festival's Gulf Coast Market kiosk. I know, I know, the okra is a thickening agent in traditional sauces, but the chicken and sausage both probably needed to be spiced a bit more so their flavor would punch through the mix a bit more. Instead, the mouthfeel and texture of the gumbo sauce becomes the most memorable aspect of the dish. However, from the same Gulf Coast Market booth -- the new Shrimp Po Boy was packed with the most spice and heat out of all the items I sampled this year! Rather than being in a hot sauce, the shrimp themselves were fried in a hot rub (which is more or less, traditional for a shrimp po boy)… and simply paired with a couple slices of tomato and a mayo-based sauce of some type. 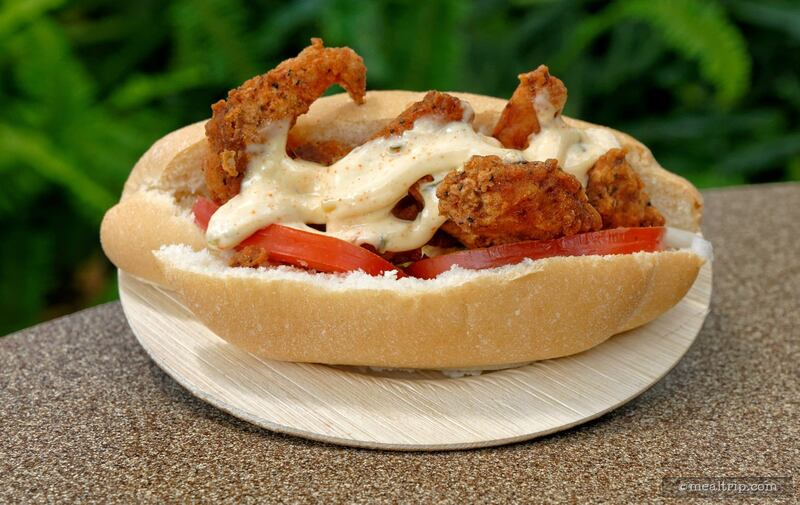 The Shrimp Po Boy is also from the Gulf Coast Market booth at SeaWorld's Seven Seas Food Festival. There could have been a little more "slaw" of some type on the sandwich to give a cool snap here and there… but all in all, this was a great little item… "if" you are ok with "spicy hot" things. My final two items explore the idea that you can wrap bacon around just about anything. 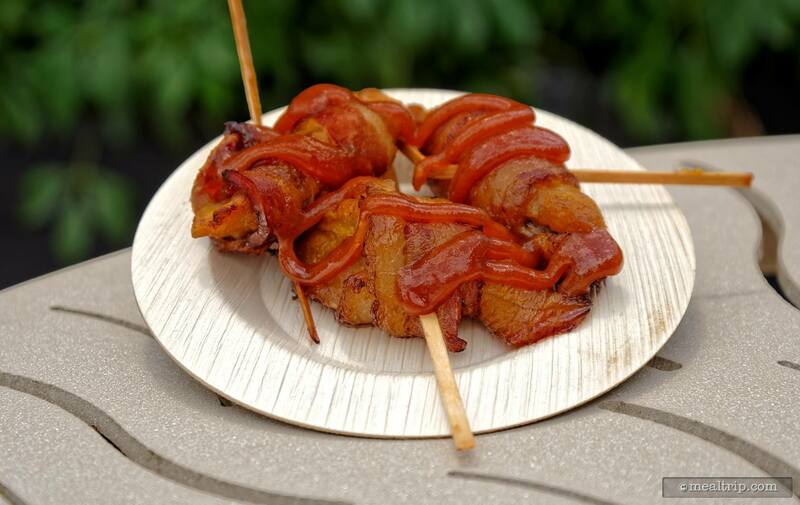 New from the Asian Market this year -- Skewered Pork Wrapped in Bacon! This one has a slight Hoisin sauce coating that's brushed onto the bacon, which is wrapped around the pork-on-a-stick. While I would have liked the hoisin to also be a little present in the pork itself, this dish was a nice combination of flavors. Also on the plate was a small slice of pineapple and a little seaweed salad garnish. 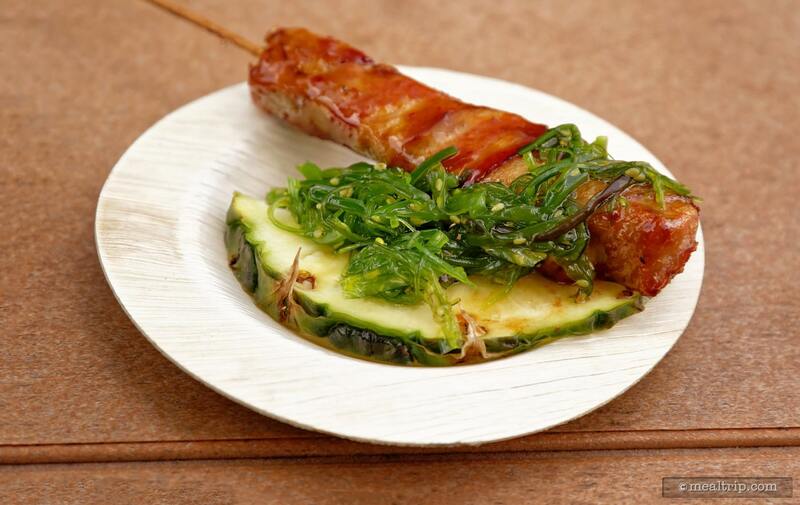 Skewered Pork Wrapped in Bacon with Seaweed Salad and Pineapple from the Asian Market booth. Finally, moving over to the Brazilian Market I tried the new Bacon Wrapped Sweet Plantain, which is… basically what it sounds like -- but it also has a Brazilian inspired papaya caramel-like fruit sauce drizzled on top. I really liked this one quite a bit, but would struggle with where to put this item in a "planned meal" line up. It's not really an appetizer or a dessert, or a "side" item per say. With that being said -- it's kind of all three of those things! Maybe it's best served as a street-food -- at a festival just like this one! I would have liked for the bacon to be a bit saltier against the sweet plantain, just to provide more contrast in flavor -- but this was a really good idea -- one worth exploring a bit more. The Brazilian Market's Bacon Wrapped Sweet Plantain item is drizzled with a thick and sweet papaya fruit sauce. That wraps up my coverage of SeaWorld Orlando's Sever Seas Food Festival 2018! If you want to sample any of these items this year, you'll have to hurry ... Sunday, April 29th, 2018 is the last day for the festival this year! The weekend only celebration of street food from around the world will be back next year though, as will many of the most popular items! We'll let you know as soon as we have the dates for next year's festival. Check out all the prices before you go! Click here to see our text-based collection of Menu Boards and Prices for the SeaWorld Seven Seas Food Festival. Click Here if you would like to see our photos of the menu and price boards for the 2018 SeaWorld Seven Seas Food Festival (this link/list also shows some of the beverage options available at each booth, along with the special beverage-only booths).